Pores play a vital role in the healthy functioning of our skin, keeping it healthy and hydrated by providing a pathway for hair to grow and for sebum (the skin’s natural oil) to reach the surface and protect our skin from drying out. The size of your pores is largely determined by genetics, and people prone to drier skin tend to have barely visible pores while those with oilier, thicker skin have larger and more obvious pores. This may seem distinctly unfair until you remember that skins with a higher sebum production are likely to age better and to form fewer wrinkles than drier skins. Pore size is affected by sun damage and by the natural ageing process, both of which cause the epidermis (upper layer) of skin to thicken and a rim of cells to collect around individual pores and create the appearance of larger pores. Poor skin care and reduced natural exfoliation of the skin combined with hormonal fluctuations can exaggerate pore size as a build-up of surface oil and excess skin cells collect around the edges of pores. This build-up can also cause clogged pores, resulting in whiteheads when the pores are fully clogged and blackheads when they’re partially clogged. Blackheads are essentially plugs of hardened sebaceous oil, dead skin cells and bacteria that have chemically reacted with oxygen in the air and turned blackish-brown through oxidisation. 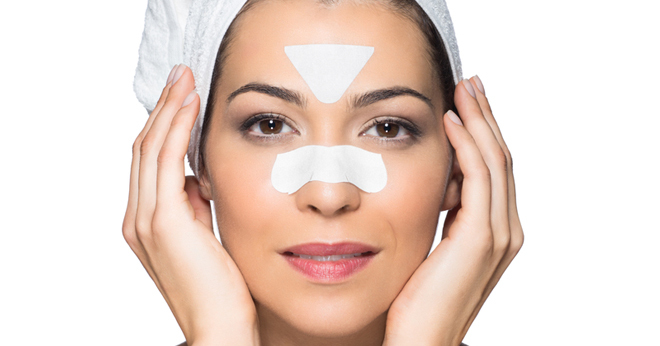 While there’s not a great deal you can do about the size of your pores, there are certainly ways you can minimise their appearance and significantly reduce the likelihood of blackheads. The first line of defence is your daily skincare routine. It’s best to use only gentle, water-soluble cleansers – not bar soaps, as the ingredients that are included to “hold” the bar shape can clog pores. After washing your face and before applying moisturiser, use an astringent such as witch hazel or apple cider vinegar, or a gentle toner. Avoid using thick or creamy products that clog the pores and encourage the production of more oil, or products that are excessively drying or irritating to your skin as they also stimulate oil production. Choose those with a gel, liquid, or very thin serum texture, especially ones that also contain antioxidants to improve cell production and help your skin heal. Once every two weeks, give yourself a facial steam treatment to help open and unclog the pores. Make gentle exfoliation a part of your weekly routine, both to remove excess skin cells from the surface of your face and to improve the shape of the pore and allow for a more even flow of oil. Use a salicylic acid (BHA) exfoliant in gel or liquid form with no added irritating ingredients, or make your own by combining baking soda and water, lemon juice and sugar, or salt and sour cream into a thin paste. Apply it to your face with light circular movements, leave it for three to five minutes then rinse off well with cool water. Make a point of washing your pillowcase at least once a week to remove any dead skin cells and oils. Be careful about the brands of make-up you use and be absolutely sure to get it all off at night; whenever possible, leave your skin make-up free and if necessary blot your face with tissues throughout the day to soak up excess oil before it can accumulate. A careful skincare routine combined with healthy lifestyle choices will go a long way to keeping your skin hydrated, preventing clogged pores, stopping blackheads in their tracks, improving texture and maintaining a generally glowing complexion. pores are the worst.thanks very helpful article! Great article – pore size is genetically determined, and affected by skin hygiene, age, gender and environmental factors – after-all – the pores are there to serve a purpose. One new mask that really does make a difference is the NIOD Flavonone Mask by Deciem. I have an oily T-Bar area that is problematic. I have pimples that are hard…one in the middle between my eyebrows and one just above my left eyebrow that just does not seem to go away…can you recommend any solutions. Facial steaming really helps especially when one incorporate herbs. I do get blackheads when I slack off with my skincare routine. Luckily I don’t get black heads but I do get normal pimples. Helpful tips indeed now if only I can get into the routine of removing my make up everynight.